"Here's A Quick And Easy Way To Keep Track Of All Your Pets Important Medical And Treatment Records"
There's a lot to think about as a responsible pet owner and it's all too easy to lose track of important things. It's so easy to forget vaccinations and worming, which can have potentially disastrous consequences for our little furry friends. Equally important, but very easy to overlook is regular flea control. Anyone who's had a runaway flea infestation in their home will tell you that it's something they'd never want to experience again. Pet Medical Recorder is a simple to use software tool which will generate a set of special forms to allow you to keep track of all your pets medical and treatment information. It will keep records of vaccinations, worming and flea control, so you can see at a glance when the treatment needs repeating. It will also record details of any medicines that your pet needs to take, general medical history, vet contact details, immunizations and health insurance details. 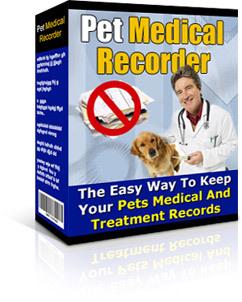 Pet Medical Recorder can be used to generate forms to keep tabs on as many animals as you want, all with just a few button clicks. Now you can keep on top of your pet's medication and treatment the easy way with your copy of Pet Medical Recorder. Your copy of Pet Medical Recorder comes with our special collection of two special treat ebooks, packed with a total of over 200 special treat recipes. With a total of over 200 recipes, you're sure to find something really special and unusual to delight your favorite little furry friend. Your copy of Pet Medical Recorder comes complete with Master Resale Rights. You can also add it as a bonus to other items you sell if you wish, or include it in packages and membership sites. This special software allows you to easily keep track of all your pets medical and treatment records. Consider the potential cost in vets fees and heartache that could result from missing a treatment and I'm sure you'll agree that this software is a real bargain at just $9.97! Remember that this price includes Full Master Resale Rights. And of course, don't forget the great pet treat ebooks on top. Despite the amazingly low price of this package, I know you may still have a few lingering doubts as to whether Pet Medical Recorder is right for you. If at any time within the next 30 days, you decide that Pet Medical Recorder isn't right for you, just send me a quick email and I guarantee to refund your money in full, no questions asked. goods and services provided by sell1on1.com. 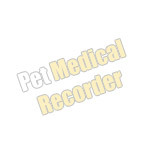 Requirements Pet Medical Recorder is for use on PCs running Microsoft Windows. It also requires a spreadsheet program to be installed on your PC. Suitable software is included with the package. Alternatively if you already have Microsoft Office or another office package installed on your PC, you can use its spreadsheet program instead.